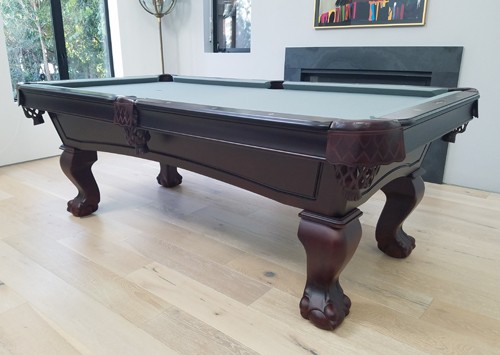 This Classic Pool Table features rails made of solid maple wood with mother of pearl diamond sites and K-66 profile natural gum rubber cushions. It has a 1.25" thick solid maple single routed arch frame cabinet. The legs are hand carved ball and claw style made of solid maple. As expected of any top quality Pool Table, the Lincoln Mahogany features a 3 piece 1 inch thick diamond honed slate with a solid core liner.